Verrazano established himself among the best 3yos of 2013 with victories in the Gr.1 Wood Memorial and Gr.1 Haskell Invitational. He took the latter by nearly 10 lengths and posted a 116 Beyer. Verrazano’s dam Enchanted Rock produced the Gr.2 winner El Padrino to PULPIT and his family has also produced a Gr.1 winner to SEATTLE SLEW, Graded winners to A.P.INDY, CAPOTE and MINESHAFT and a Listed winner to TAPIT. 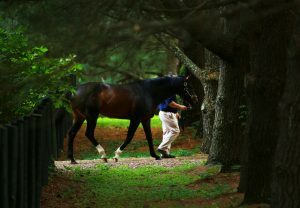 Verrazano’s sire MORE THAN READY also sired dual Gr.2 winner Hungry Island from an A.P. INDY mare from this family. Verrazano should therefore suit PULPIT mares, as well as daughters of MALIBU MOON, MINESHAFT, FLATTER and CONGRATS. More Than Ready sired the versatile Gr.1 winner Catholic Boy from a daughter of BERNARDINI. There is plenty of scope for more MR PROSPECTOR blood. More Than Ready’s Gr.1 winner Daredevil is out of a mare by FORTY NINER, while Gr.2 winner Boynton has a dam by DISTORTED HUMOR. More Than Ready’s 2018 Gr.1 winner Funtastic has a dam by QUIET AMERICAN, and More Than Ready had 10% black-type winners from foals out of UNBRIDLED’SSONG mares. Verrazano’s second-crop foals were headed by a $750,000 colt out of an EMPIRE MAKER mare. The GONE WEST branch suits More Than Ready He has Graded/Group winners out of daughters of CAME HOME, ELUSIVE QUALITY, MISWAKI, MR GREELEY and ZAFONIC. More Than Ready, who is inbred to Almahmoud, has been considered a natural match in Australia for mares by DANEHILL, who is closely inbred to Almahmoud’s daughter Natalma. This has produced five Gr.1 winners. More Than Ready also sired Graded/Group winners from mares by PINEBLUFF, REDOUTE’S CHOICE, FLYING SPUR, LURE and WAR CHANT, plus Graded winners from daughters of DANSILI and DANEHILL DANCER. The SADLER’S WELLS line merits respect, as Verrazano’s family produced Gr.2 winner Al Khali to MEDAGLIA D’ORO. More Than Ready sired the speedy Regally Ready, the Breeders’ Cup winner Pluck and the 2018 2yo Gr.3 winner Sir Truebadour from grand-daughters of SADLER’S WELLS. More Than Ready has done well with mares by sons of DEPUTY MINISTER, including DEHERE, FRENCH DEPUTY and SALT LAKE. Deputy Minister sired the second dam of Gr.2 winner Tom’s Ready. More Than Ready has six foals out of INDIAN CHARLIE mares including Gr.3 winner Sonic Boom and Gr.2-placed Galientos. UNCLE MO mares are therefore an option. More HAIL TO REASON blood ought to suit Verrazano, an obvious route being sons of ROBERTO, including KRIS S., DYNAFORMER, RED RANSOM and SILVER HAWK. More Than Ready sired the top Australian mare More Joyous from a daughter of SUNDAY SILENCE. Although Verrazano is out of a Giant’s Causeway mare, he could suit mares with more STORM CAT blood. More Than Ready’s Gr.1 winner Rushing Fall has a dam by FORESTRY.